Trim, wash and break the cauliflower up into pieces or small florets. In a large, lidded saucepan, melt the butter and add the cauliflower pieces, stirring them to coat with the melted butter. Cover with the lid and cook over a low heat for 10 minutes. Add the onion, garlic, thyme and bay leaf to the cauliflower. Stir, then cover and cook for a further 5 minutes. In another pan, heat the milk and chicken stock together. As soon as they have come to the boil, pour them over the cauliflower. 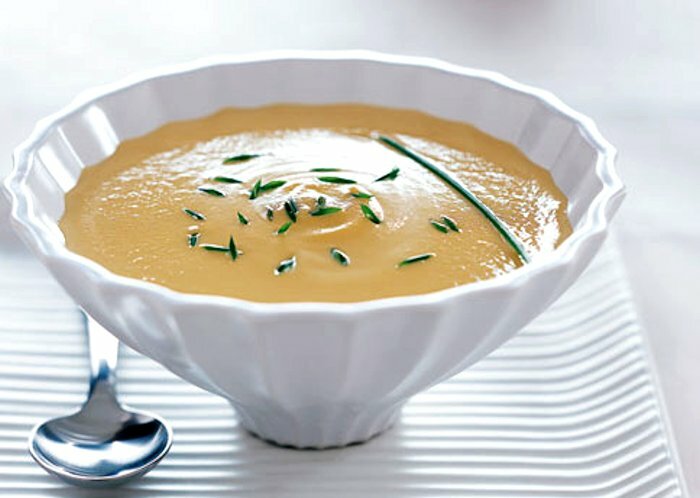 Turn up the heat and cook the soup on a rapid simmer for half an hour or until the cauliflower is soft. Check the seasoning of the soup, adding salt and pepper to taste. Take the pan off the stove, pour the soup into the liquidiser and blend until smooth. When smooth, pour the soup back into a saucepan and bring to the boil. Turn off the heat and add the truffle oil. Whisk the soup with a hand blender until it froths. Ladle it into lightly warmed soup bowls and serve immediately.